You are browsing the Blog for Bald Eagle. 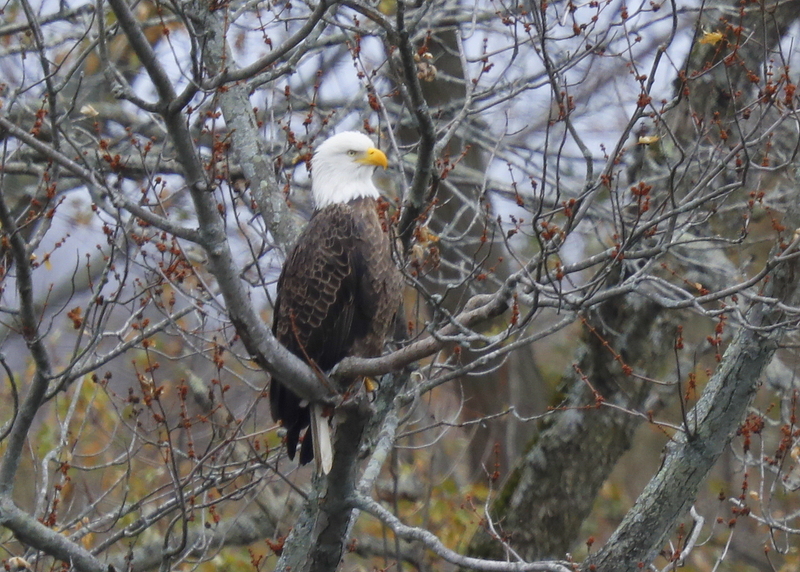 An adult Bald Eagle in regular perch on a tree branch overhanging the Merrimack River. Mostly Cloudy morning with hardly any wind and temps in low 20’s! An adult Bald Eagle was seen eating fish on a tree snag along the north side of the Merrimack River this morning near the Ferrous Site in Lawrence, MA. It ripped the fish apart and constantly looked around in between bites. It was a bright sunny morning, with clear skies, wind fromt he SW at 12MPH and temperature around 36F. While watching the Eagle, and its many looks all around skyward, it started to make series of high-pitched calls. Clearly, some type of threat was in the air nearby. Stopped and looked up to find a juvenile Bald Eagle come roaring by overhead. The adult Eagle takes off, the younger one chases in pursuit of the fish in talons of the adult; younger one then departs and flies upriver; older one swoops down and lands on the nearby ice edge where the Spicket River empties into the Merrimack River; quite a show! 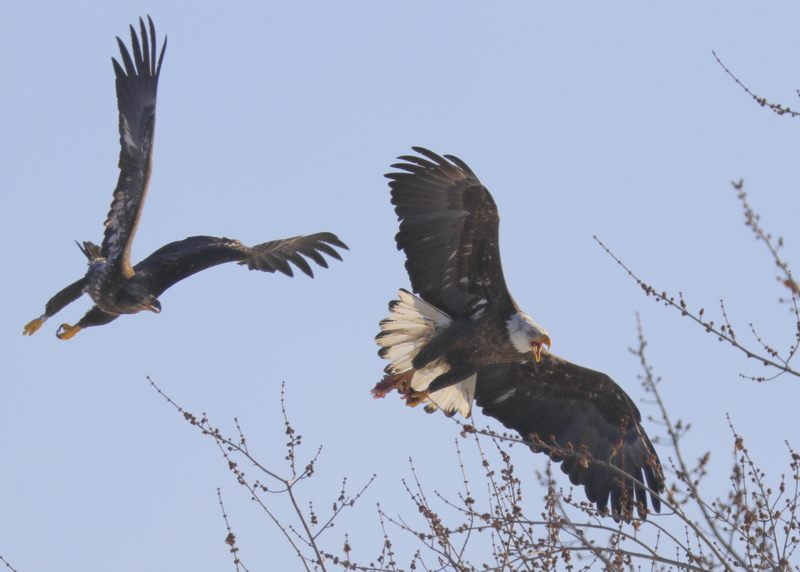 Two adult Bald Eagles perched along Merrimack River, 125 yards apart, and then a third adult flies in from the west, loops a number of times and lands on a proximate perch, while one of other eagles takes off downriver; quite a nice show! 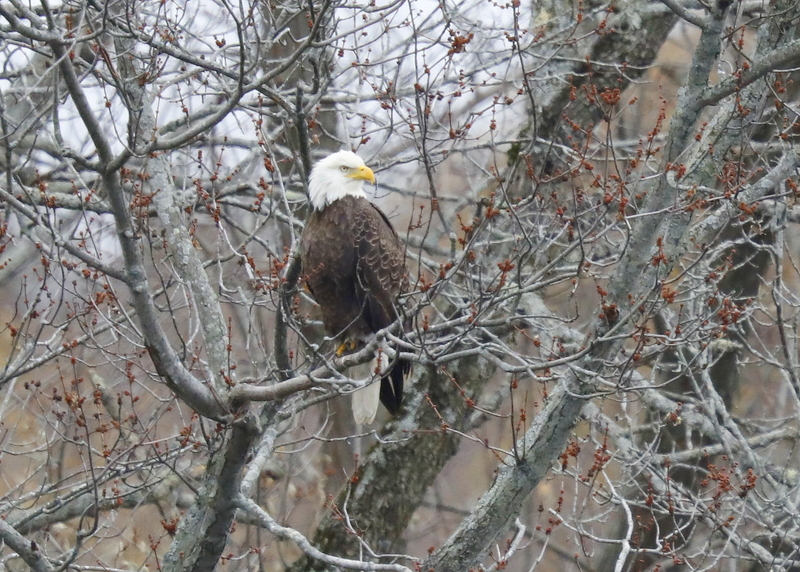 The number of wintering Bald Eagles along the Merrimack continues to grow as the weather gets colder. Another bright sunny morning, clear skies, winds light from NE under 5MPH, and temps in mid-30’s. 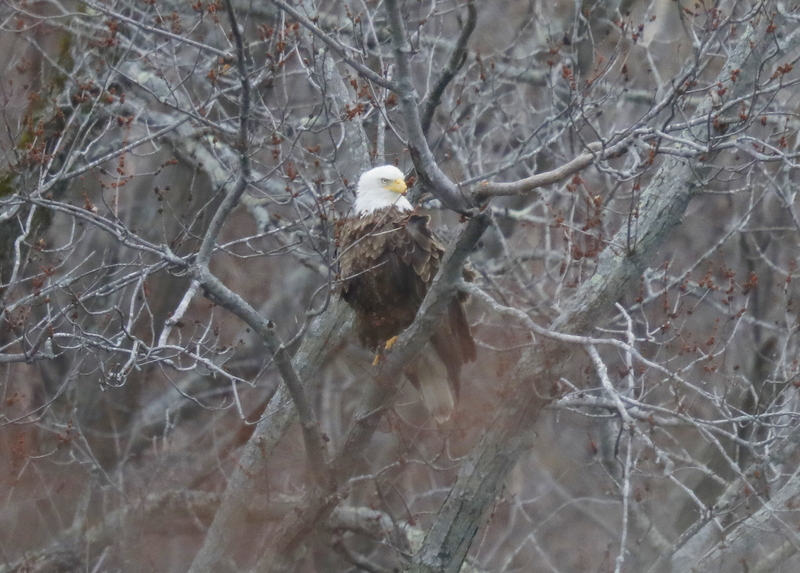 Observed this adult Bald Eagle on a regular perch overhanging the Merrimack River in North Andover. This perch location is a regular one at this time of year. It is just down river from where Sutton Pond empties into the Merrimack River, to the east of the Rt. 495 overpass. 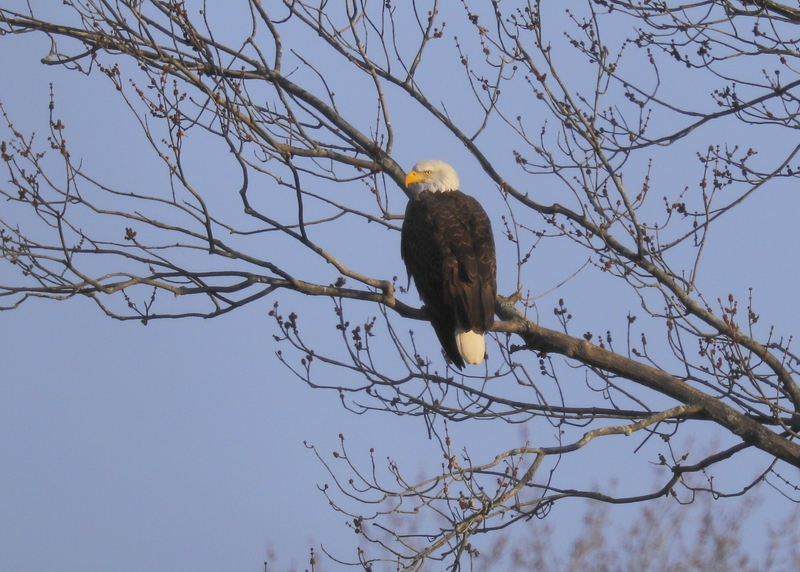 In these late fall days, Bald Eagles are seen both solo and in pairs along the Merrimack River in Lawrence and North Andover. They perch high up on branches that overhang the river. They tend to select locations that provide excellent visibility up and down the river. Bald eagle winter roosting sites typically contain open water, ample food, limited human disturbance, and protection from predators. Preferred roosts are usually coniferous or deciduous super-canopy trees. This adult Bald Eagle did have leg bands. They were only visible later when the Eagle departed in flight. Stay tuned! 2 Bald Eagle adults and 1 fledgling! Had a nice chance to observe two adult Bald Eagles and a fledgling this morning, along the Merrimack River in Essex County. The fledgling leaped up into flight from rocks along the river bed. It then hopped from one perch to another and then remained in place for a while under overcast skies, light rain, winds from SW at 5MPH, high humidity, and temp just above 70F. 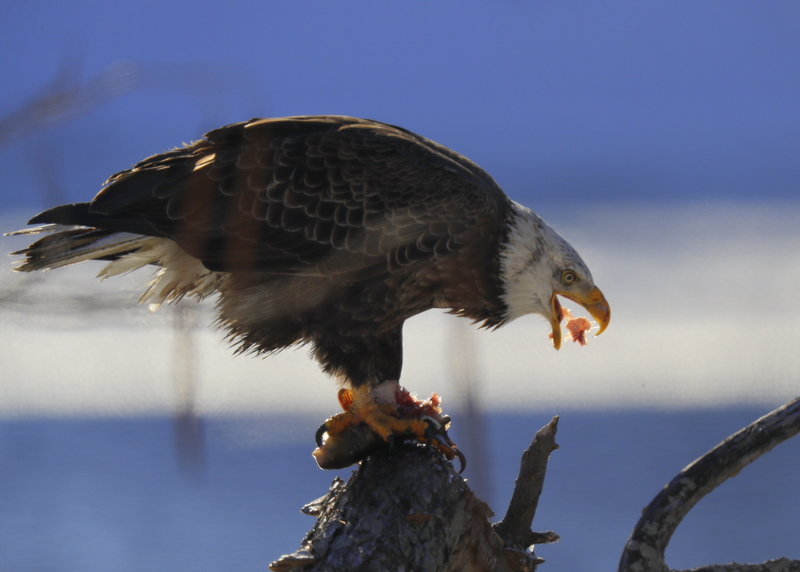 After leaving the nest, fledgling Bald Eagles are not very adept at catching fish. They pick up dead fish along shorelines first, and then progress to picking up dead fish floating in rivers and lakes. It may take months for a young fledgling to start catching its own live fish, and much longer for it to become reliable at fishing. 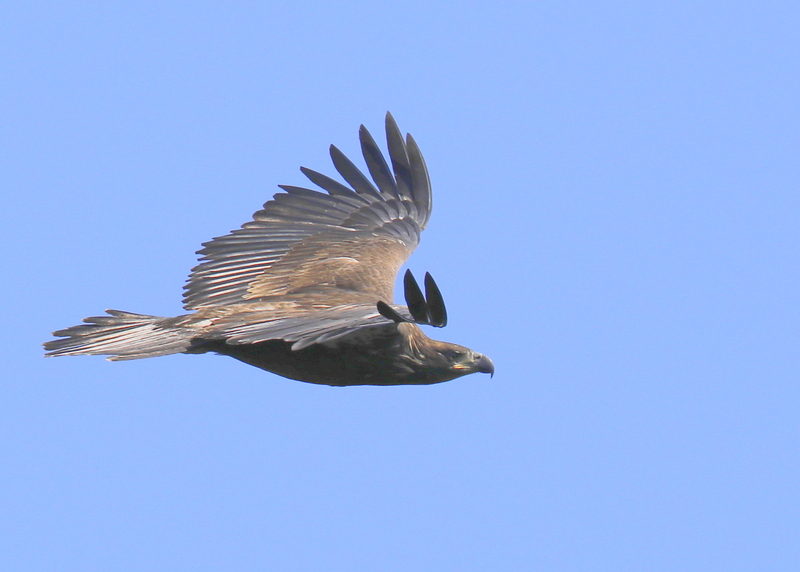 So young eagles must spend more time fishing to catch the same number of fish as adults. For these fledglings, the first months in flight are a time of enormous learning and exploring the world around them. 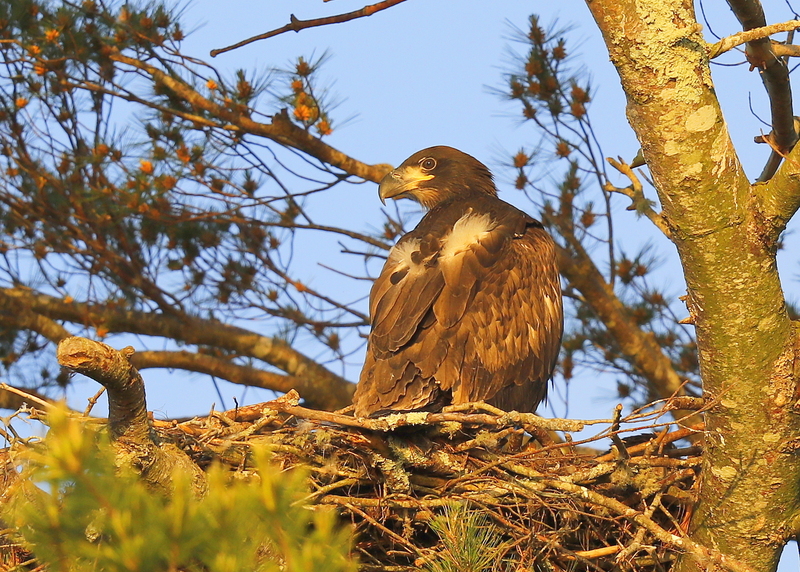 This fledgling was one of 3 eaglets that hatched and fledged early in the second week of July. So this young Eagle has had about 5 weeks on the wing and will become less dependent on parents for food in weeks ahead. 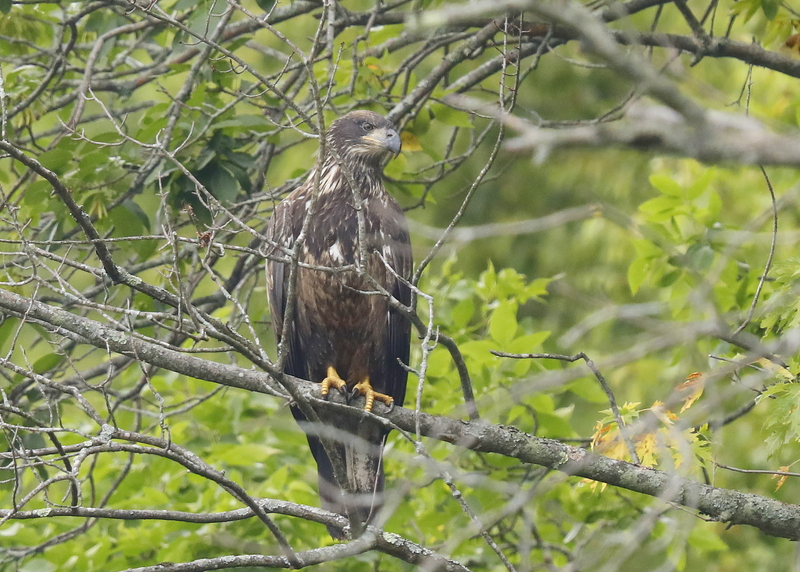 The 3 fledgling Bald Eagles continue to be seen along the Merrimack River in Essex County. They remain fairly close to the general nest site location and seem to maintain a lessening dependence on the parents for food. After fledging, they were very vocal and begging for food. The incessant cries for food have diminished as they continue to develop flight skills and began finding food on their own. Observed this fledgling, circling over the river in bright morning sun! Another fledgling was nearby along with one adult. The young birds grow rapidly, they add one pound to their body weight every four or five days. At about two weeks, it is possible for them to hold their head up for feeding. By three weeks they are 1 foot high and their feet and beaks are very nearly adult size. Between four and five weeks, the birds are able to stand, at which time they can began tearing up their own food. 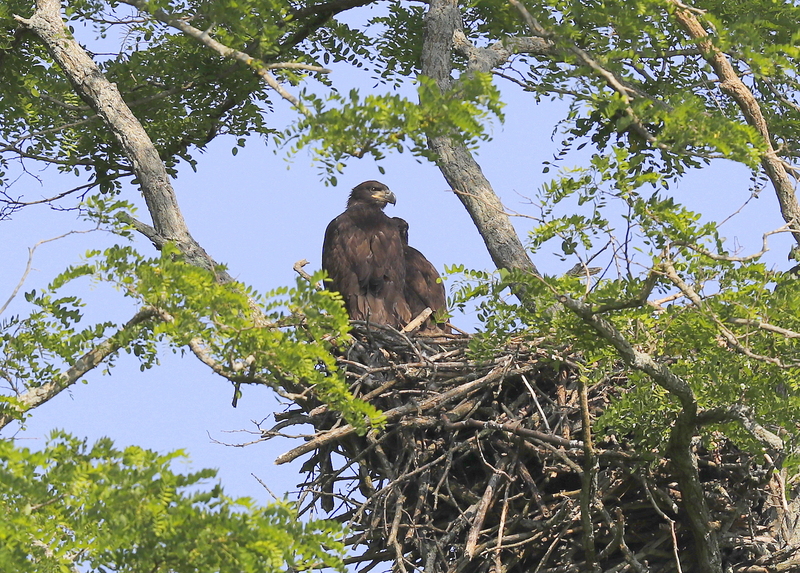 At six weeks, the eaglets are very nearly as large as their parents. At eight weeks, the appetites of the young birds are at their greatest. While parents hunt almost continuous to feed them, back at the nest the eaglets are beginning to stretch their wings in response to gusts of wind and may even be lifted off their feet for short periods. This pair of eaglets are in wing stretching mode and ready for flight very soon! As the Bald Eagle chicks grown in size the nest starts to become very crowded! The 3 chicks are now very close to fledge time. The female remains near the nest and on watch most of the time. Eaglets are nestlings for 10 to 12 weeks. By the time they are 9 weeks old, they are fully grown. Some scientists did a study keeping track of all the time that the parent eagles spent at the nest. Once the babies hatched, the female was present at the nest about 90% of the time. The male was present about 50% of the time. During the study, at least one of the parents was at the nest almost all the time. The young nestlings are directly fed raw meat starting day one. Eagles do not regurgitate food to feed their young like some other animals do.During the first two weeks, the male provides most of the food. After 3 or 4 weeks, the female provides as much food as the male, and by the late nesting period, the female provides most of the food.